Emmeline Pethick-Lawrence promoted socialist ideals through lectures, writing, and organizing for the suffrage. With Mary Neal in 1895, she founded the Esperance Working Girls’ Club, advocating an eight-hour day and a minimum wage along with an annual holiday. She was active in numerous organizations related to women’s suffrage. In 1906, she joine the Women’s Social and Political Union (WSPU) and was appointed treasurer; her home became the WSPU’s London headquarters and a hospice for suffragettes recovering from their prison experience; she herself served six terms of imprisonment for her involvement in direct actions. She and her husband edited the journal Votes for Women. In 1912, they were expelled from the WSPU for their opposition to the window-smashing and arson campaigns organized by Emmeline and Christabel Pankhurst. During the 1920s, she became involved Marie Stopes’ birth control campaign, unfortunately tainted by Stopes’ racist commitment to eugenics. Unknown artist. 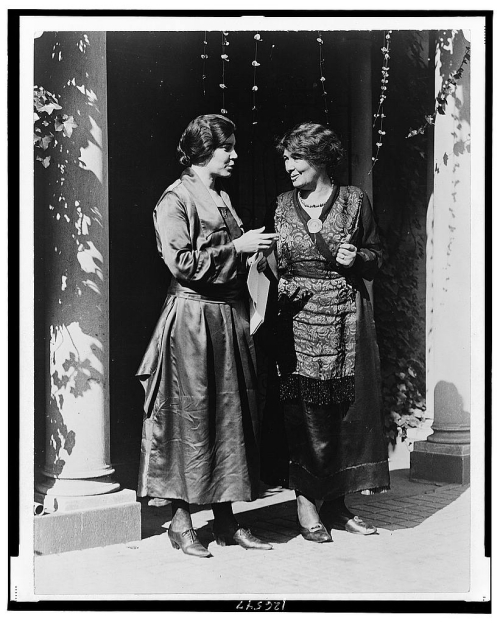 Mrs. Pethick-Lawrence, British suffrage leader, and Miss Alice Paul of the National Woman’s Party, Washington, D.C., between 1910 and 1920(?). Library of Congress, Prints and Photographs Division, Washington, D.C.